While we are constantly working on improving the sync performance on the server side we have recently made changes on the iPad side. 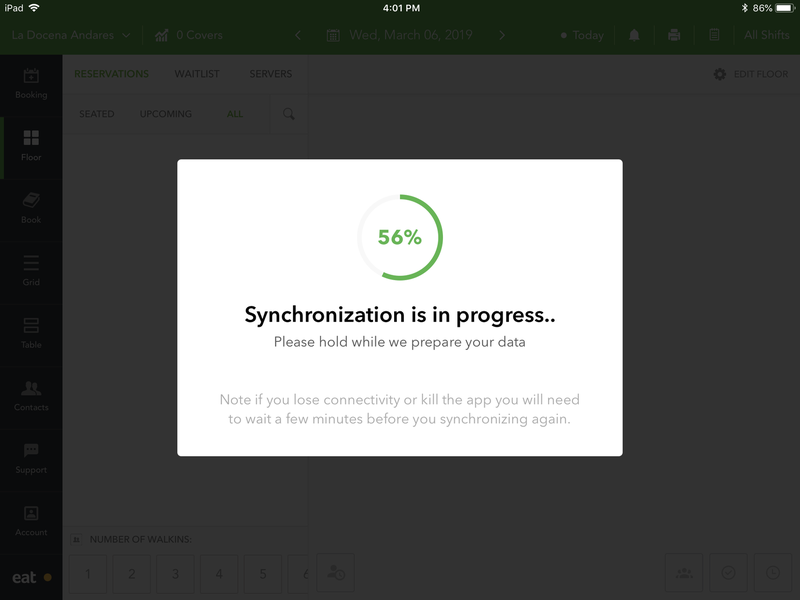 In order to make sure that restaurants don't face difficulties when trying to sync their restaurants through our iPad app, we have improved the sync UI to show real time progress as well as alert restaurant users of other devices trying to sync at the same time. We've also released a few enhancements on our waitlist feature. 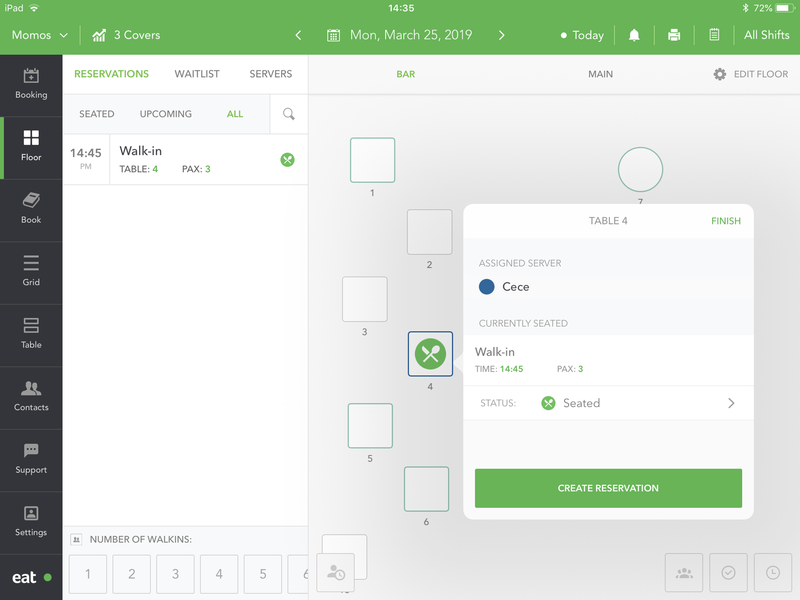 The "Add to Waitlist" icon was move to Floor View next to the walk in selector, making it easier for busy restaurants to quickly build up their waitlist. 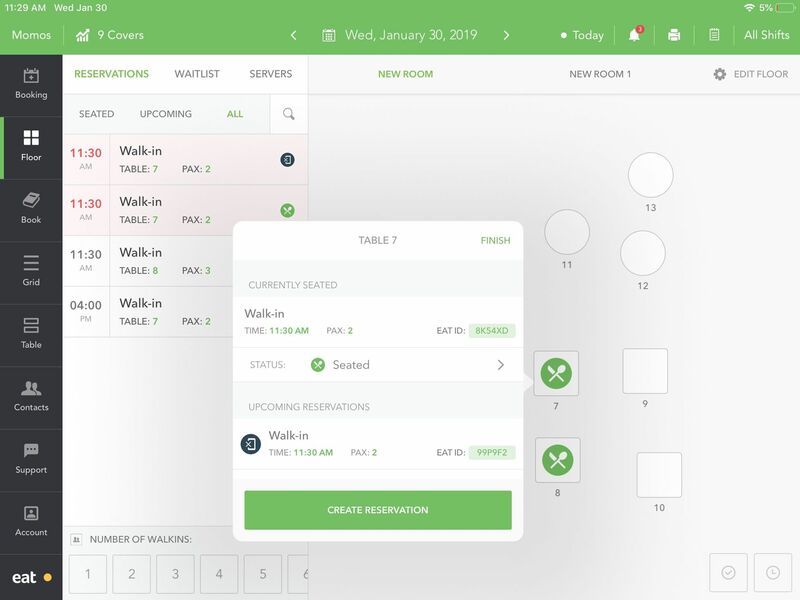 The Waitlist tab will now alert the restaurant operator when the guest has exceeded their promised wait time. Now there is a new icon next to the timer and finish reservation icon to show party size info next to each table. Conflicts based on time or party size. A time conflict indicates that 2 or more reservations on the same table are overlapping in terms of start and end time. Time conflicts were handled in the past releases by just highlight which reservations that are overlapping which only shows after the reservation has been made. Now you see the conflict details as you are making the booking. You can also see the conflict details in the reservation open state. A party size conflict indicates a reservation is places on a table that is either too small or too big. Users in this case can also see more details about the conflicts in the reservation open state and while adding / editing a booking. 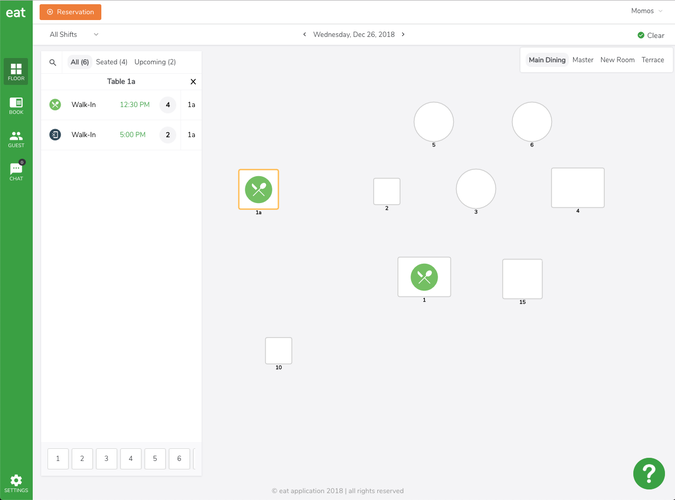 When a user adds a booking now, the app initially preselects a free table based on the number of covers. If the user clicks on another table, the app ignores the preselected table and goes with the user preference. Now you can search for restaurants by name, which is super helpful for restaurants with multiple restaurant locations. We have also as usual made a lot of bug fixes under the hood. 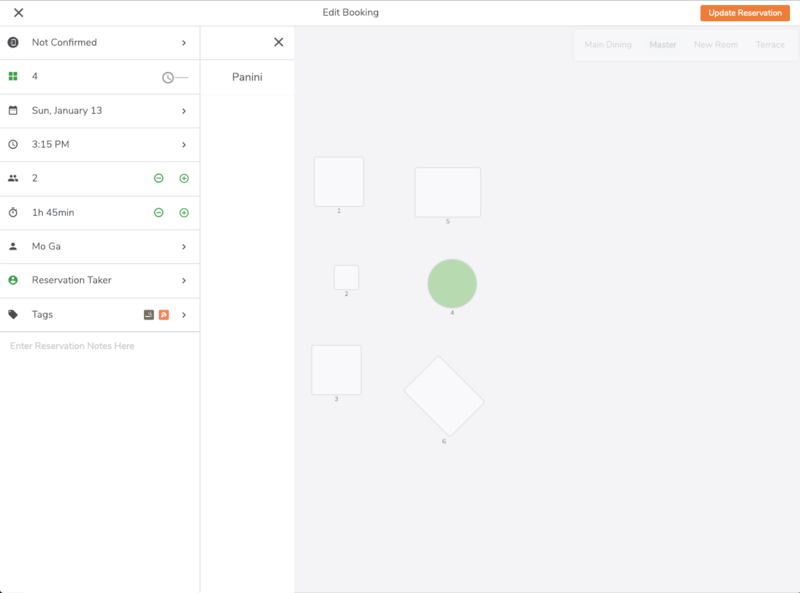 Restaurants now have the ability to manage their reservations through Grid View. Grid view divides the hours of the day into columns (4 am - 4 am). There are now "Add Booking" call-to-actions in every column to help the user create a booking quickly and also select the correct party size from the bottom carousel. 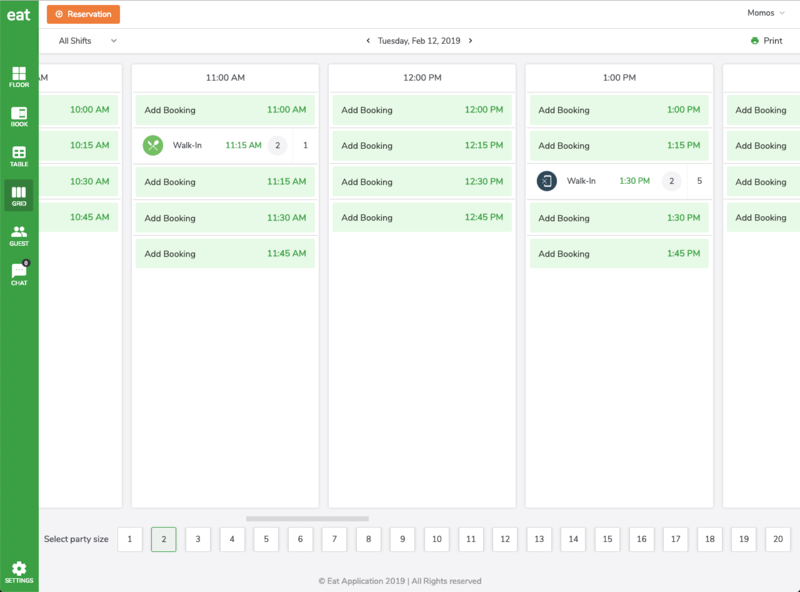 The user can also filter out the columns based on shifts. Table view is another way of managing restaurant information through a spreadsheet. The spreadsheet divides the hours of the day on the x-axis and the tables in every room on the y-axis. Collapse every room by clicking on each section header. Add new reservations by clicking on a cell, which pre-selects the room and time on the add booking screen. Drag and drop any reservation to another time or table. 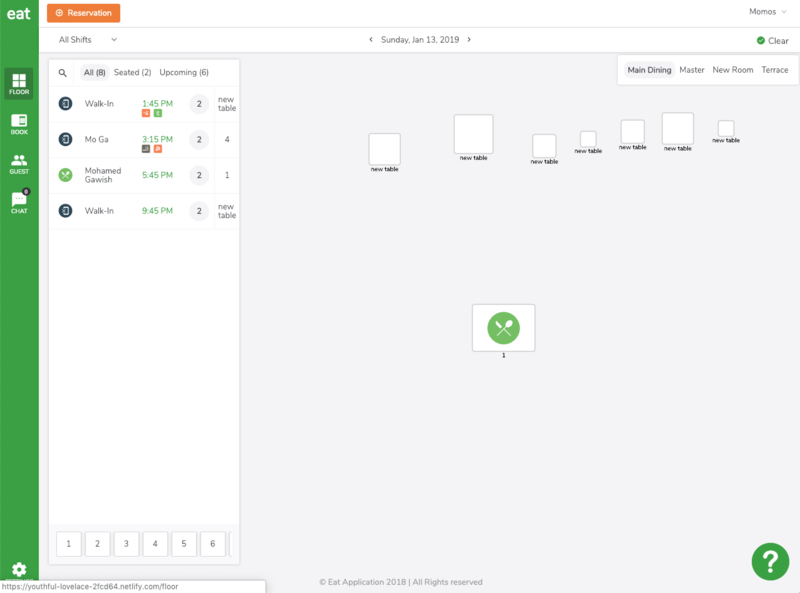 Users can now view a contacts reservation history and create a new reservation for that user. There are a few other technical improvements that were applied on this screen for fetching and updates contacts lists. This is an admin feature that allows the user to activate/deactivate tables from online reservations. Tables that are unavailable for online reservations will never be selected if a reservation is made from any of our consumer apps. As usual they every release we try to improve the performance of the app and identify and solve new issues. The top bar is a navigational elements that should be consistent across all screens, so we've added the following fixes. Now restaurants have the option to see the number of covers per room in their print reports. Standardizing all view to display reservations between 4:00 am - 3:45 am. Users can now add custom tags to their reservations and be able to see them on Reservation Open State, Floor View and Book View. Note that the custom tags need to be set on admin.eatapp.co before they can be accessible on the app. Here are some of the bug fixes we've added in this release. 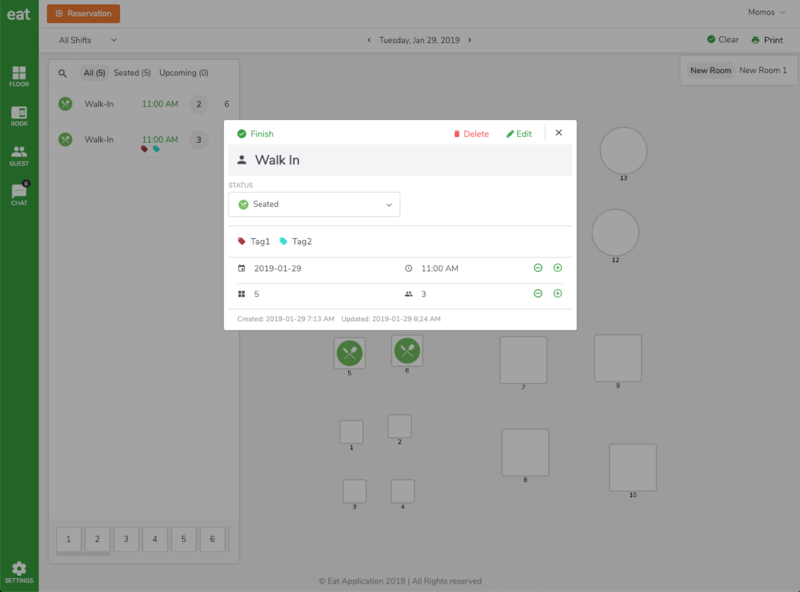 Restaurant managers can now print their reservations for the day from the web version of Restaurant Manager by Eat in the format seen below. When the user click on the Print icon in 'Floor View' or 'Book View' the report opens in a new tab, allowing for it to be saved locally or to be printed through the native printer pop-up window. Restaurant managers now can select their reservation tags in the Add and Edit Booking screens. Selected tags are visible in Floor View, Book View and the Reservation Open State. Users can know see the reservations associated with a table by clicking on it. The way this feature is implemented on the web is slightly different than on the iPad version of Restaurant Manager by Eat. Instead of a pop-up, when pressing an occupied table on the web, the reservation window on the left is filtered to only show that single reservation. Users are then able to click that booking to see its details or press the 'x' to remove the applied filter. In the future restaurants will be able to set their shifts dynamically through settings.